Hello Pitrow, how is beautiful Newberg? I had many Filipinos working where I did too and enjoyed their company. The short ribs sound kind of Korean to me but the lumpia are pure Filipino (well with some influence from the Chinese, of course) and my wife loves to make those and to innovate new ones, her recent lumpia consisted of crab and cream cheese and she often does mashed potato and cheese lumpia. Later: I saw your blog about doing apple molasses. That looks really good! And the cinnamon rolls were nice too. My wife loves to make those. How much did they charge for the cured and smoked pork chops? I do those here, using 1 to 2 inch chops, cured for 2 day in a wet brine and then smoked for 2 or 3 hours with hickory. Wonderful to eat, but your molasses glaze sounds like a step up the ladder! Could you give me an idea of the weight of your "slab of bacon"? Is it in the 3 kilo/6.5 pound area? A bit heavier or lighter? I like making bacon, but have only done it a few times. I smoke mine on a Weber Kettle usually, though I have finished it by heating it until 150F internally in my oven without smoke. Thank you! Hello Tatoosh, and welcome to the forum! When I prepared the belly bacon above, I had one pork belly and split it into two pieces. I don't know exactly, but would estimate the weight of each piece as about 1.5-2 kilos. The weber kettle is a perfect place to smoke bacon...I would start it low and slow and bring it up gradually to that 150°. Yeah, that is my approach. I smoke at 150F to 175F (smoker temp) for 3 or more hours. 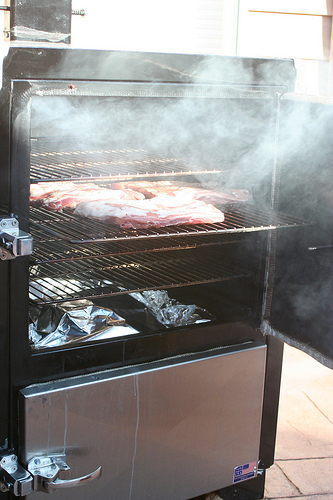 Then if weather permits, I bring the bacon to 150F internal temperature by raising the smoker to 200F to 230F. Last time we made bacon it was in a typhoon. We had blankets hung to protect the Weber from the wind, but I never could get it over 160F smoking temp, so we finished the bacon in the kitchen oven after smoking. Lots of great recipes here, so I really look forward to exploring the forum and sharing with my family! Don't worry too much about getting the bacon to an IT of 160 or so...it's cured. 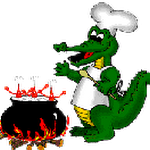 It will be fine as long as you cook it before using even if it is cold smoked the whole time. I only take it to the 150F range because I share it with folks that are over 60 years old (including myself) so I like to be on the safe side. Thanks for the link. I am looking it over closely. I'm getting ready to start two whole bellys myself. My basic cure contains a lot less salts than yours does, and have had no problems with the ratio. 4.Generous cup of sugar - maple syrup, honey or brown sugar. Thanks for the suggestion Dan...I think old Rytek's recipe was a bit too heavy on the salt. Has anybody experimented at all with bourbon in the cure? I am attempting a 4lb slab, no rind with a basic maple syrup cure and just adding a shot or two of a decent enough bourbon. It's been in the cure a little over a week and I have been flipping it every day. Just trying to figure out what to expect. I tried a Canadian Bacon once using a pork tenderloin that had "bourbon-flavour" in it. It came from the meat plant that way, so I am not sure if it was true bourbon or some sort of artificial "bourbon flavouring." The flavour did add a little something - depth, character, call it what you will. Not sure how to describe it, but it was good! Very often when bourbon or other whiskey is added it contributes a sense of umami to the finish. You don't taste the booze, as such. But there's an underlying mellowness and all the other ingredients taste more like themselves. It's simple enough to see how this works. Make your favorite barbecue sauce, adding bourbon (or, better yet, Southern Comfort) to one batch and not to the other. Taste them both, and you'll see the difference. I gotta say...that's one fine idea! Please post your results when the cure gets done, as I'll probably give this a try next time I make my bacon...and seeing as how the last batch is finished up...it should be within the next few weeks. I hope you don't mind me asking, but would you mind cutting off a small piece before you smoke it? I'd be interested to hear your thoughts of how the simple cure (with Bourbon addition) tasted. I think it may be helpful to get the flavor profile before smoke and after smoke. I think Brook hit the nail on the head....it will come through in the finished product, but I would not worry about it being overpowering at all. I use bourbon in my barbecue sauce, and have used it in many applications...it just seems to give a really nice depth of flavor. Bourbon sounds like it would work for me! I use Ruhlmans recipe for Maple bacon, I also sub Apple Molasses and Honey for the Maple syrup - my favorite! Oops, I forgot to check prior to smoking, but as historicfoodie said, it didn't really give the bourbon taste I kind of wanted but did seem to bring some of the maple to the forefront. Pretty tasty overall, but I was really after that hint of bourbon. It cured about 10 days. Next up is a 5lb slab I just grabbed that I am going to try curing in coffee and see what happens there. I'll try to remember to try it before and after smoking. Thanks for the update pitfriend. For the coffee, I wonder if adding instant coffee to the rub would offer more flavor than adding some made coffee. Actually, I need to make some more bacon, I'm all out...again! I opted to get a nice dark espresso roast from a place I go to. I am a little hesitant to try an instant coffee since I don't really care for that flavor. Since I am going to be drinking the coffee too, I figured may as well get something I like. I used a pretty basic cure that I have done a couple times and just substituted a couple things. I am going to try to see if I can wait 2 weeks to let the flavor really get in there. I am a big fan of strong flavors, so hopefully this will work out to my liking. Some will be going in to a bacon jam recipe that is already accented with coffee, so it should work out nicely there even if the bacon on its own isn't where I want it to be. You would not happen to have a recipe for Maple Cured Bacon and hams, would you? A Buddy and I are trying to find a Maple Cured Bacon and ham recipe...his Mom and Dad used to raise many hogs per year and made maple cured bacon and hams and sold them at the Broad Street Farmers Market in Harrisburg Pennsylvania. He has looked thru all his Mom and Dad's old recipe books and can not find the maple cured recipe anywhere. I cure and smoke bacon regularly and get my MAPLE SUGAR CURE at AlliedKenco.com. A two pound bag of cure will cure 100 pounds of belly. The typical pork belly down here weighs around 11 pounds give or take. Some weigh closer to 12 or 13 pounds. And each belly is cut into thirds to fit inside of my Weber Smokey Mountain Smoker. that's great news for me, since i am always trying to find a way to maple cure meats; i think that the maple cured/maple smoked flavour is just about as good as it can get! I am not a representative of AlliedKenco. But they sell everything needed for meat processing, everything ranging from spices, mixtures to equipment.